The attorneys at Delay & Curran are devoted to their clients, their community and to justice. With partners who have served as Washington State Bar Association President, Spokane Bar Association President, Board of Governors, Commission on Judicial Conduct, Worker’s Compensation Chair, Worker’s Compensation, Adjunct Professors and Rules of Professional Conduct Chair. Delay, Curran, Thompson, Pontarolo & Walker, P.S. takes pride in having provided sound legal guidance for over five decades. Founded in 1960, its lawyers and staff are committed to providing quality legal representation. The firm has received the highest rating by national law directory, Martindale-Hubbell and is listed in the highest tier of US News & World Report 2010 Inaugural Edition of Best Law Firms in Worker’s Compensation. 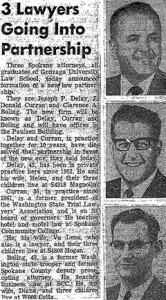 Joseph Paul Delay graduates from Gonzaga School of Law and begins practice in February of 1952. With a work ethic from a Sandpoint dairy farm, Joe continues to work at the Hillyard Liquor Store to help grow his legal practice. As he builds his reputation for honesty, integrity and real estate acumen he leaves the Hillyard Store and grows his firm. Joe Delay and J. Donald Curran go into practice together focusing on Complex Litigation, Personal Injury, and real estate transactions. Don Curran, a Gonzaga School of Law Graduate, clerked for Joe while in law school prior to partnering. Clare Boling becomes a partner at Delay and Curran. Mr. Boling formally worked for the State Patrol and was a prosecuting attorney before joining Delay and Curran. He graduated from Gonzaga School of Law. Robert H. Thompson, a Gonzaga School of Law Graduate, becomes a partner and the firm is renamed Delay, Curran, Boling, and Thompson. He begins a new practice area at the firm: Worker’s Compensation. Clare Boling is killed when his twin engine Cessna 310, which he was piloting, was forced to make an emergency landing in the Palouse countryside. Michael J. Pontarolo becomes partner and the firm name is changed to Delay, Curran, Thompson and Pontarolo. He is a graduate of Gonzaga University School of Law and practiced domestic relations before transferring his practice area to Worker’s Compensation. Delay, Curran, Thompson, and Pontarolo continue to practice together and build community ties. Between the partners, they will volunteer their time to take on such roles as Spokane County Bar President, Washington State Bar Association President, Ethics Committee Chair, Board of Governors, Committee for Judicial Conduct, Adjunct Professor, Gonzaga Trustee and much more. Michael J. Walker becomes licensed in the State of Idaho and expands the firm’s practice in Worker’s Compensation and Social Security Disability into neighboring Idaho. Clients from Coeur d’Alene/Sandpoint and south to Lewiston/Clarkston area call on the firm to provide assistance regarding work injury claims. Michael J. Walker becomes partner to create Delay, Curran, Thompson, Pontarolo, and Walker. Mike is also a graduate of Gonzaga School of Law and was a clerk for the Court of Appeals before joining the firm. Delay and Curran continue to be a well-respected and professional law firm in Spokane, Seattle and Northern Idaho. Focusing on Worker’s Compensation, complex real estate transactions, Contract Law, and Personal Injury. Delay and Curran stays small and continues creating unparalleled loyalty with its staff, most of which have been with Delay and Curran for over two decades. Nicholas J. Pontarolo becomes an associate attorney with Delay, Curran, Thompson, Pontarolo and Walker. Our firm has continued to evolve and refine its legal practice to best serve clients. We take great pride in providing sound legal advice and forceful advocacy/litigation skills. We are proud of our longevity and the respect we have developed over the past 63 years. Our attorneys and staff can be found at 601 West Main, Suite 1212, Spokane, Washington 99201 or in our Seattle office at the Smith Tower, 506 2nd Ave., 25th Floor, Seattle, WA 98104.